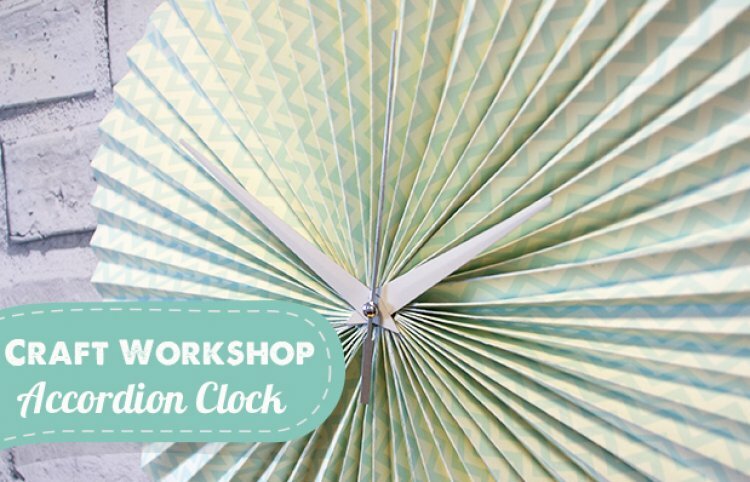 After seeing a similar clock for sale in one of our favourite lifestyle magazines we had to try and make this clock. It is relatively easy to make but you will need a bit of patience. 1. Take two sheets of matching craft paper, we chose a fun chevron design, cut them in half horizontally. 2. Now for the patience part, score all four pieces of paper at 1cm intervals down the shortest width of the paper. 3. Fold the paper of it concertinas to form zigzags. Glue all four pieces of papers together so you have a tube, with your preferred design on the outside. 4. Push the top of the tube inwards to flatten it down & create the centre of the accordion clock. 5. Cut an 8cm circle out of card and pierce with a 1cm hole in the middle. Use a hot glue gun to stick to the back of the accordion shape to fix it in place. We loved making this projects and think they would look great personalised with embellishments & displayed with pride in your home. Show us your crafty makes in our project gallery.